VietPress USA (Oct. 3rd, 2018): Yesterday on Tuesday night at a rally in Southaven, Miss., President Trump mocked the credibility of Christine Blasey Ford, one of three women who accused his Supreme Court nominee Brett Kavanaugh of sexual assault. Democrats wrote to Senate Judiciary Committee Chairman Chuck Grassley, R-Iowa, challenging a Tuesday tweet by GOP aides saying prior investigations never found "a whiff of ANY issue — at all — related in any way to inappropriate sexual behavior or alcohol abuse." Democrats wrote that the GOP tweet contained information that is "not accurate." The FBI report arrived to Senate late today on Wednesday, The Senate braced for a crucial initial vote Friday on Brett Kavanaugh's tottering Supreme Court nomination after Majority Leader Mitch McConnell set his polarized chamber on a schedule to decide an election-season battle that has consumed the nation. A showdown roll call over confirmation seemed likely over the weekend. McConnell, R-Ky., cemented the process late Wednesday and announced that sometime during the evening, the FBI would deliver to an anxious Senate the potentially fateful document on claims that Kavanaugh sexually abused women. With Republicans clinging to a razor-thin 51-49 majority and five senators — including three Republicans — still vacillating, the conservative jurist's prospects of Senate confirmation remained murky and dependent, in part, on the file's contents, which are supposed to be kept secret. Senators can read it in early morning on Thursday, Oct. 4, 2018. WASHINGTON (AP) — The Senate braced for a crucial initial vote Friday on Brett Kavanaugh's tottering Supreme Court nomination after Majority Leader Mitch McConnell set his polarized chamber on a schedule to decide an election-season battle that has consumed the nation. A showdown roll call over confirmation seemed likely over the weekend. McConnell, R-Ky., cemented the process late Wednesday and announced that sometime during the evening, the FBI would deliver to an anxious Senate the potentially fateful document on claims that Kavanaugh sexually abused women. With Republicans clinging to a razor-thin 51-49 majority and five senators — including three Republicans — still vacillating, the conservative jurist's prospects of Senate confirmation remained murky and dependent, in part, on the file's contents, which are supposed to be kept secret. 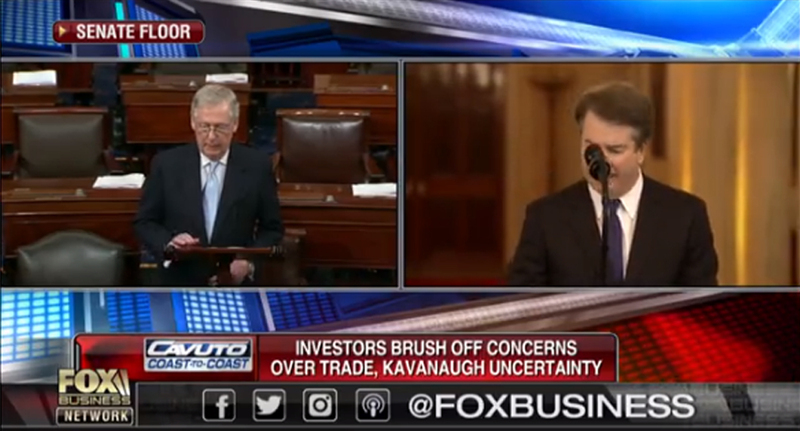 "There will be plenty of time for members to review and be briefed on the supplemental material" before Friday's vote, McConnell said to the nearly empty chamber. In a rare moment of randomness in what's been a deadly serious process, the normally meticulous lawmaker's cell phone emitted a ringtone during part of his remarks. Lawmakers were planning to begin reading the FBI report early Thursday, with senators and a small number of top aides permitted to view it in a secure room in the Capitol complex. Senators are not supposed to divulge the contents of the agency's background reports. In a statement Wednesday night after McConnell set the vote in motion, Ford's counsel wrote: "An FBI supplemental background investigation that did not include an interview of Dr. Christine Blasey Ford — nor the witnesses who corroborate her testimony — cannot be called an investigation. We are profoundly disappointed that after the tremendous sacrifice she made in coming forward, those directing the FBI investigation were not interested in seeking the truth."